Newcomb - Lorraine Stickney passed away March 9, 2016 at Glens Falls Hospital. She was a resident of Washington Center in Argyle, N.Y. since September 2015. In July 1965, she married the late Walter Stickney and she then moved to Newcomb, N.Y.
Lorraine was raised in Silver Lake and was a graduate of AuSable Central School. After her move to Newcomb she worked part-time for Specialty Silicone Products, Inc. She was a homemaker and enjoyed crocheting, sewing and reading. 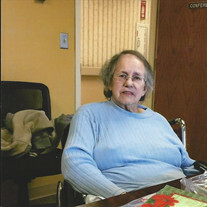 Lorraine was a communicant of St. Therese's Church and also a member of the Newcomb Seniors. Mrs. Stickney was also predeceased by four brothers and three sisters. She was the youngest of eight children. Survivors include 2 daughters, Debbie Harr of Saranac Lake and Shari Murray (Dave) of Hartford, NY. She is survived by four grandchildren: Charlie and Sheri Harr and Robert and Justin Murray, five great-grandchildren and many nieces, nephews, great nieces and great nephews. Mrs. Stickney will be greatly missed by her family and friends. Friends and family may pay their respects on Monday March 14, 2016 from 10:00 A.M to 11:00 A.M. at St. Therese Catholic Church in Newcomb, N.Y. A Mass will follow at 11 A.M.
Burial will be in spring at a time to be announced in the St. Therese Cemetery in Newcomb, N.Y. Donations in her memory may be made to St. Therese Catholic Church, Newcomb, N.Y.